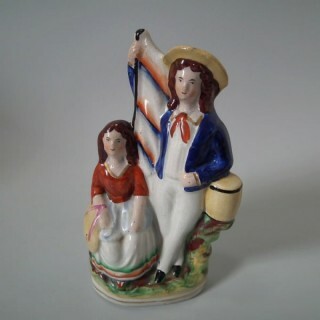 Staffordshire group with a maritime theme which features a sailor stood next to his girl, seated on a shaped base. Multi-coloured with underglaze blue version. Bright gilt base line and embellishment. Flatback, decorated mainly to the front. Vent hole to the reverse. Book reference,’Victorian Staffordshire Figures 1835-1875′ Book 1, by A.& N. Harding, page 235, figure 817. Generally good. Slight rubbing to gilt. KILN EFFECTS: shrinkage line to the front of the base; a few specks of kiln soot caught in the glaze to the reverse; flecks of stray coloured glaze to the front. RESTORATION: Stabilised and retouched hairline running from right side of his face over on to the reverse. Retouched paint losses to his shoes, jacket and barrel.